1. browse around to find books that you like. →You can see the list of available pocketbooks at the moment on our BOOKS tab above. →Can't find what you are looking for? It only means that we do not have any copy available. So please don't send me any text or messages asking for it. Send us a M﻿ES﻿SAG﻿E @ FB/iluvpocketbooks or storiray@gmail.com . ​*Regarding Shipping Rates & Deliveries please read below. →Once order is placed an invoice and payment instruction is given, you have 3 banking days to settle your payment. → All orders not paid within 3 banking days will be automatically canceled. → If order is already paid please send us a facebook message again so we can have the books shipped to your address. → Tracking # will be posted on our Facebook page after courier pick up the packages. Prices are usually indicated on each title or book photos. All prices displayed exclude shipping fees. The shipping fees will be added to the order in the checkout step and might differ based on which city/ province/ country your order is shipped to. You can select shipping country when entering or browsing the website, or when entering your details in the checkout step. Please find more information about our delivery charges for each city/ province/ country on **Delivery and Shipping. "Defective" book/s (books w/ 5 or more missing pages, or any other defects) may be returned for a replacement. We do not send replacements unless we have the books. Yes, you have to send us back the "defective" book before we send a replacement. For books with 4 or less missing pages, send us a facebook message of the Book Title & Aunthor, Page No. with black page or email us with subject "MISSING PAGES" at storiray@gmail.com. No Meet Ups. We only ship all orders via courier. .
We have the books delivered via 2GO, JRS Express, ERIM EXPRESS or LBC nationwide & PHILPOST for orders abroad. 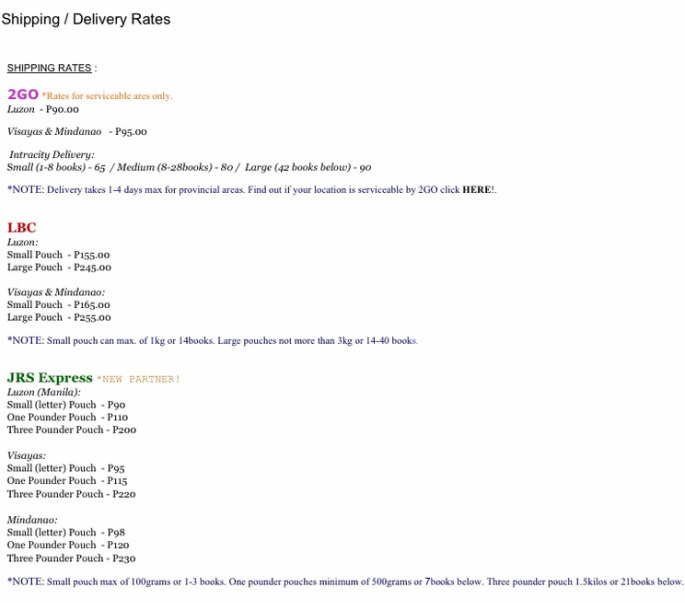 For clients abroad we ship the books through Philippine Postal Office ( or other courier service w/c you prefer). Or we can send it to your friend or relative in the Philippines and let them bring/ ship the books to you. Once the TRACKING RECEIPT IS POSTED & given by us, WE ARE NO LONGER RESPONSIBLE FOR ANY SHIPPING LOST & DELAY. As we do not have any hold with the item once it has been shipped.Though we will help you on tracking your package online, & or call up the courier office to confirm and to check. *EXPRESS : 2-4 BUSINESS DAYS. NO MINIMUM WEIGHT. *IEMS : 3-7 BUSINESS DAYS. NO MINIMUM WEIGHT. *PhilPost Parcel : 10-15 BUSINESS DAYS. *MINIMUM OF 2 KILOS.